Plants make attractive, informal low hedges or edgings. In winter or early spring, cut out last year’s growth to make way for new stems. At that time, you can also divide clumps for increase, though it’s easy to start new plants from cuttings (take them before flower buds form). When buying named varieties, be sure to obtain cutting-grown plants; seedlings vary in flower color and habit. In cold-winter climates, nepetas are occasionally used as a substitute for lavender (Lavandula) in borders and edgings. Most species resent heat combined with high humidity. In desert Zones 12 and 13, most are best treated as winter annuals. They tolerate regular moisture if the soil is well drained. Sterile hybrid of N. racemosa and a European species; often sold as N. mussinii. Soft, silvery gray-green, spreading mound grows to 1 ft. high and 1 1/2–2 ft. wide. Scallop-edged, heart-shaped gray-green leaves to 1 in. long. Attractive to some cats, who enjoy nibbling on and rolling in plantings; insert short sticks in the ground among the foliage to discourage cats and prevent destruction. 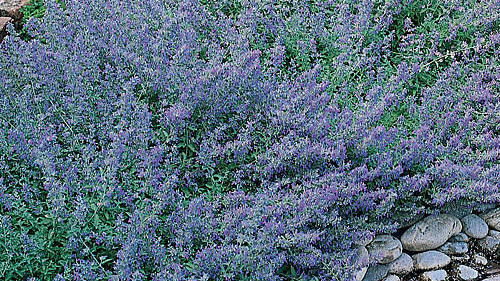 Loose, lax spikes of 1/2-in., lavender-blue flowers in late spring, early summer. ‘Select Blue’ has darker flowers than the species; ‘Snowflake’ has pure white blooms. ‘Dropmore’ grows to 1 1/2 ft. high and 3 ft. wide; it may be a hybrid involving another species. Set plants 1–1 1/2 ft. apart for groundcover.